serving counties in Missouri and Illinois since 1994. Marler Surveying Co, Inc. specializes in efficient and quick turn-around for real estate transactions, boundary and improvement surveys, surveyors real property reports (spot surveys) and more. No matter the type of survey you choose, our surveys will inform you of what you own. 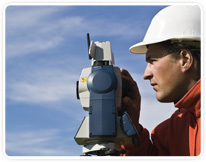 Spot surveys and stake surveys are common services a new or existing homeowner uses to identify the boundary lines of their newly purchased or renovated property. If you aren't clear what both of these surveys offer, contact our customer service department today so you can say "I know what I own".